Wow! 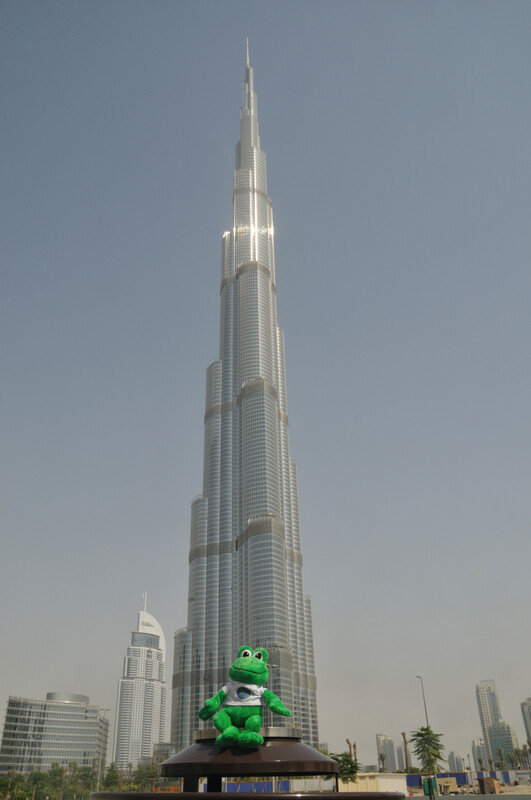 I have seen some big buildings in my froggy life, but this one is very, very tall! It is called the Burj Kahlifa and it is in Dubai in the United Arab Emirates (UAE). When we were here, Shane told me many interesting things. Many people think that Dubai is the capital of the UAE, but the capital is Abu Dhabi. The 828 metre (2,716 feet) tall Burj Khalifa is the world’s tallest building, and it has 160 floors. It is almost 50% taller than the second tallest building – the 510 metre (1,671 feet) Taipei 101. 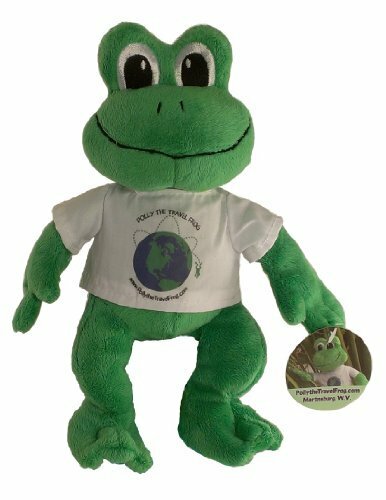 The building has an observation deck on level 124 (452 metres or 1,483 feet) but it is too high for a little frog! There is also a restaurant on level 122, but it is still too high! At night you can see lights on the Burj Khalifa and it looks beautiful. The building also has offices, apartments, and hotels. Near to the Burj Kalifa is Dubai Mall, the world’s largest shopping centre – it is 112 hectares (278 acres) in size and has 1200 shops, an aquarium, ice-rink and cinemas. I did lots and lots of hopping in trying to see it all in a day! That is amazing! Apartments, hotels, offices, and a restaurant all in one building! The mall sounds like it’s bigger than some towns. Thanks for the picture and information. I love the fact that I have to scroll down on my screen to see the whole building! Wow…that’tall! I guess you would need to carve out an entire week to visit all the places in the mall! Amazing! Wow, that’s a tall building. Were you able to go into the building and up to the observation deck? If so, that must have been amazing! What does the view look like? City buildings? Desert? The ocean/sea? I’m very curious. You can go to the observation deck, but as a frog, I don’t like high places, it is better for me to stay on trees and in ponds on the ground. The best views are on a clear day but the heat haze makes seeing very far difficult on most days. If Polly were like superman, she would be able to leap over this building in a single bound! Great post. Wow! And I thought Pittsburgh had an impressive skyline! That’s tall! That’s biiiiiiiiiiiiiiiiiiiiiiiiiiiiiiiiiiig but I made a building on peices of paper and it was bigger than that. This building that you took a picture of is really awesome. What year was the building built? When did you take this picture? Did you go into the building? Hello Mr Miller’s Class, thank you for your message, sorry I took long to write to you. The building started construction on 21 September 1004, and it was opened on 4 January 2010. I visited in July 2010. Shane did not take me into the building, because we went to Dubai Mall instead. Hello Mr Miller’s Class, thank you for your message, sorry I took long to write to you. The building started construction on 21 September 2004, and it was opened on 4 January 2010. I visited in July 2010. Shane did not take me into the building, because we went to Dubai Mall instead. Dear Polly number 7, you are so amazing. That is so cool that you visited the tallest building ever. p.s you are so, so awesome!